The road up to Arosa from Chur/Coira (595m) is long! It starts rather steep up from Chur and there is no water until far up the valley. The road becomes flatter and even dips here and there after Maladers and more so after Castiel. At St. Peter (1259m) there is a grocery shop. 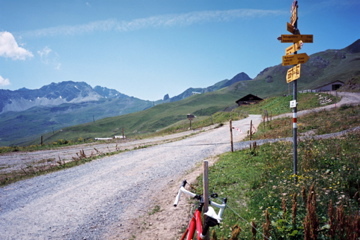 Here one could arrive via the road from Passugg (738m) and Tschiertschen (1345m) via Molinis (1040m) if coming from Lenzerheidepass/Parpaner Höhe (1550m). At Langwies (1373m) is perhaps the only good place for filling up the water bottle along the road. After Langwies it starts to climb steeper again, but then there is a 50m descent before the climb continues steeper still on the other side of the valley. When arriving at the first big hotels there is an obvious big road going off to the right which you should follow. One passes by a golfing area and here it gets confusing, but you should really just stay on the asphalt road which is flat up here for a while. Then it becomes a little nicer on a smaller road, which could be filled with walkers. The asphalt ends just before the pass at Mittler Hütte (2010m) from where the gravel road continues for 180m to the pass. Other comments It is best to return down the same way if you have a road bike. For all practical purposes this qualifies as an asphalt road pass as the last little stretch poses no problem for a road bicyclist and is very short. The last stretch above Arosa also makes the climb up here nicer and harder. Arosa itself is a disappointing place and even up at Sattel, it is not really possible to take a photo in any direction without getting ugly ski lifts etc. in the photo. The best part of the climb is arguably between Castiel and Langwies where it is quite nice and not so busy with SUVs and the hopeless tourist industry up at Arosa. I hate Chur as I never manage to find any grocery shop in that city and also cannot find any place to fill up water (but you can buy a lot of lady handbags). The road over Tschiertschen is a very nice alternative if coming down from the Lenzerheide/Parpaner Höhe and lets you escape Chur.